Yes, our showroom is located at No. 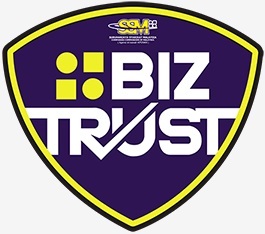 7 Jalan Bandar Rawang 12, Pusat Bandar Rawang, 48000 Rawang, Selangor. Should you require further information on any of our products please do not hesitate to contact us via email or telephone. Some of our products can be delivered next day; others can take up to 12 weeks. Please refer to product details for estimated delivery time. If any products are not available at the time of your order we will contact you immediately via e-mail, you will then have the option to wait for the products to come into stock or we will give you a full refund. Leisureplex Sdn Bhd cannot be held responsible for delays in the delivery caused by the supplier, or any other third party. At no time will compensation be awarded should delivery take longer than anticipated due to unforeseen circumstances. Do you sell to institutions / schools / colleges / businesses or local authorities as well as domestic customers? We happily sell to these customers and can offer special discounts for bulk purchases. We are also able to offer discounts on bulk purchases to individual customers. Will you install and set up the table? Will my new table fit my room? When buying a games table - it is important to check the size of the room to see if your intended table will fit. If a table is too large for the room you may not enjoy playing on it. A good idea is to draw a plan of the room and measure it at the nearest points to where your table is intended to stand. Do not measure into bay windows. All large furniture should be outside the measurements. Positioning a table diagonally in a room is not a good option, as the corner pockets are brought closer to the walls. Below you will find a guide for the room sizes for different sized of the tables. 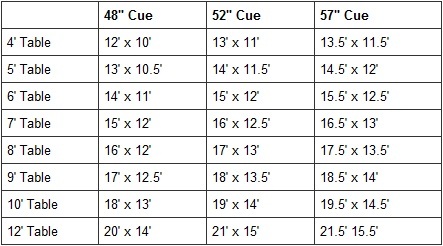 The minimum room size measurements allow for normal shots to taken with a standard length cue. Awkward long shots, or shots hard against the cushion will require shorter cues. The room size recommendation, dependent upon cue length. How to level my table? Leveling a table is dependent on the type of table. On some tables the bottom plate that meets the floor turns and screws in and out, allowing you to change the table level with a twist of that plate. On other tables you have to slide a thin piece of material under the leg. Generally, if you have a few strong people, leveling a table is not very complicated. Have two strong people to raise up the side on which the leg is that you need to raise and slip your shim in/screw the leg out. Place a spirit level across the width of the table at one end and screw the table feet up or down until level. Repeat at the other end of the table, across the width, corner to corner. Finally place the level down the length of the table and raise or lower one end of the table by means of the leveling screws, adjusting both feet at one end by equal amounts until level along the table. Check levels again and repeat if necessary. Now that you've gotten the table fairly level, you can test it by rolling a cue ball slowly at various places on the table and see if it rolls true. Make your final adjustments based on this. Be careful, if you put your pool table on a carpet, wait some time for the table to settle down. Moreover, if you have a table that shifts fairly easily from a push, in any event the table will not stay perfectly level for very long. Caution: Do not try to do this without the proper number of people in the proper physical condition to help. Even a "light" table is quite heavy and you could harm somebody.